Just ask any man what Brazil is famous for, and they’ll probably say, football or women. It’s widely recognized that Brazil has some of the most beautiful, sought after women in the world. Until recently, marrying one of these women would have been no more than a pipe dream for most men. But times are changing fast. We now have the internet revolution. Meeting people in exotic far off lands is no longer a fantasy. With internet dating, singles from across the world can come together like never before. You don’t have to be up for marriage to use the site. Even though most are there for that reason. Don’t think it’s just wealthy middle aged men either that use these services! At cupidsviews, we’ve seen testimonials and success stories from people of all ages and backgrounds. These men and women want to reach out further these days when they’re looking for their life partner. The reasons are easy to fathom. In a nutshell, BrazilCupid is for just that. It’s a website where you can meet and socialize with Brazilian women and men. From home. By and large, BrazilCupid is designed for people looking for relationships of the romantic kind. That basically means someone to spend the rest of your life with. Yes, when you go on there you’ll see people looking for marriage. But some are also looking for hookups. Others just want to make a few online buddies. You don’t have to be up for marriage to use the site. Even though most are there for that reason. Is It “One of Those” Latin Marriage Agencies? In short, no! Now if you’ve done a few internet searches on things like “foreign marriage”, you’ve likely come across a few local agencies based in places like Brazil or Colombia. I just want to clarify, BrazilCupid doesn’t work that way. It’s not a marriage bureau. It works like a regular dating site where you browse around people’s photo ads and get in touch with anyone who you like the look of. Of course, there are no guarantees that anyone will reply! At cupidsviews, we usually check out a site over period or 1 to 2 weeks. We try to find out what works, what doesn’t and how to make the most of the website. Betty Zhao and I did this with BrazilCupid. CupidTags – Add some tags to your profile – this helps people discover you based on what you like or are in to. Verify profile – If you are at all serious, I’d recommend doing this. It’s a bit of hassle but in the long run, well worth it. Tip ● By the way, doing the things above should take you more than 30 minutes. But getting this right is half the battle. Once your dating profile is up together, you’ll be ready to start browsing around in your hunt for your new Brazilian friend. Apparently, the experts at the site tell us that this is the way that guys can find the really attractive Brazilian women. We found the best way to go about it is to stick with the free account. Do this for a while to get the hang of the website and see if it’s for you. What this means is that you won’t be allowed to talk to non-paying members on the website. What happens is they’ll see the message in their mail box, but can’t open it unless they upgrade. If you do, it’ll also allow them to open it. Now I have to admit, if you’re a guy this might be a bit of a problem. The fact is, most Brazilian girls are relatively poor. They’re using standard accounts. Brazil after all isn’t a rich country, like the U.S or Australia. So you won’t get to talk to these women. On the plus side, there are some you’ll be able to talk with. It just takes a bit more time in finding them. The search on BrazilCupid is actually standard and pretty much the same as other Cupid sites that we’ve told you about. It comes in a variety of detail. Ranging from the quick simple search to the extended “advanced search”. If you have a lot of “deal breakers” that’s the one to go for. Body types ● Apparently, the experts at the site tell us that this is the way that guys can find the really attractive Brazilian women. I’m not totally convinced about it, but then who am I to say. Anyway, it goes without saying the options they give you for search cover just about every level of appearance and lifestyle. Unfortunately there’s no way to search on paying/non-paying status. So you’ll have to do that by hand. Cupid sites have a useful, but little known feature called “quick match”. What this does is match you up with someone when you take a look at their profile. The box shows a little tick where your match preferences tie up with theirs. As I said above, this won’t work right unless you’ve setup your profile. From there, you can send a flirt or if they’re online try the chat button. What we found is that direct chat with Brazilians is always preferred over email. Looking at someone face-to-face is far more intimate and revealing than sending cold email messages. I give the overall thumbs up to BrazilCupid. It’s a super-sized website with a heap of members. Our cupidsviews users found there were rarely less than 100 people online at any given time. Making it a decent enough social experience if you want to meet and fraternize with the locals. Basically if you can’t find a Brazilian wife or husband here, you’re unlikely to find one anywhere else. The good thing is that the website is open. Meaning you can chat and contact people openly and without paid matchmakers being involved. Which is how a lot of the marriage agencies make their money. On the downside, we found a lot of the Brazilian women are on non-paying accounts. This means you have to upgrade to speak with them. 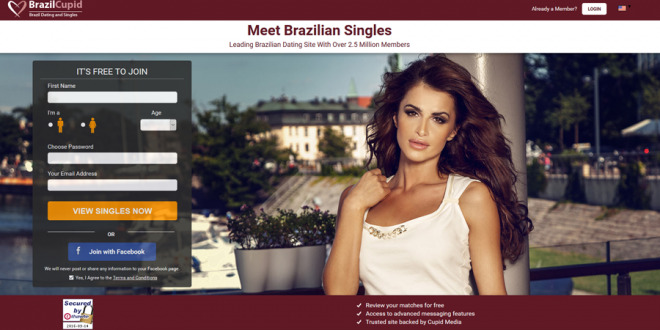 Summary : Latin people flirt, find dates or even marry at BrazilCupid. It's chock full of hot Latin women and those trying to hookup with them. Don't get carried away though until you read our review.